Memory is a tricky proposition for any of us. Is that story I am now recalling really the way it happened, or am I providing a slightly embellished version with details that have been added in the past twenty tellings in order to make it more interesting? Was the event really as funny, scary, invigorating, or terrible as I now supposedly remember? And if as a ‘normally functioning’ person I am having trouble sometimes remembering what was real and what was not, how much more suspect do my memories become – and how much more haunting and increasingly illusive – as I age and begin to suffer the dreaded dementia so many millions of my fellow humans experience? 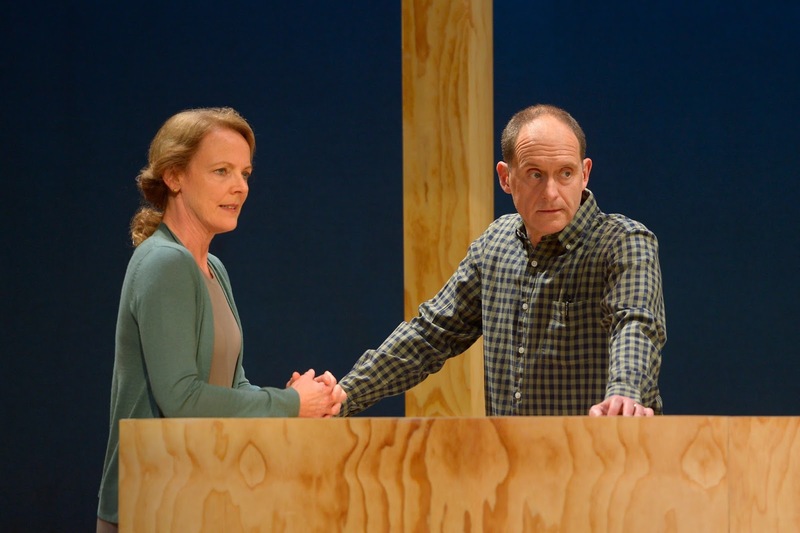 Jordan Harrison explores memories and how they are made, stored, retold, and remade to our and others’ likings in his 2015, Pulitzer Prize finalist play, Marjorie Prime, that went on to become a 2017 film by the same title. 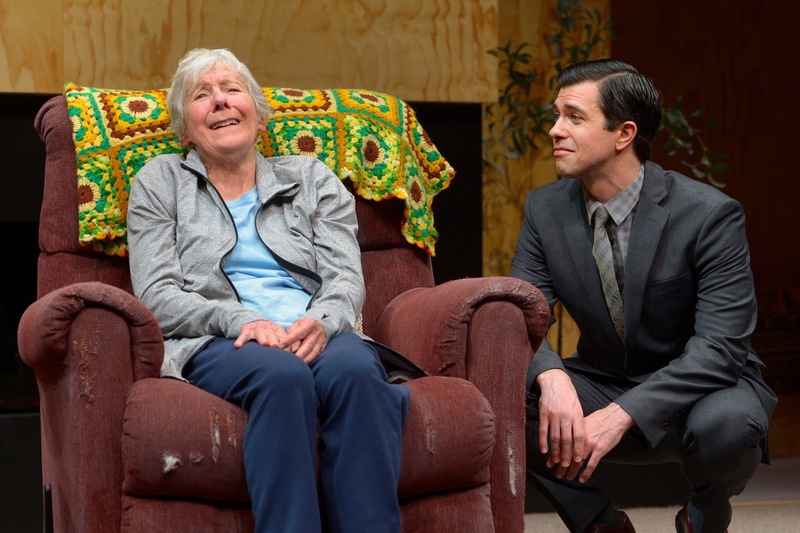 Marin Theatre Company has opened the Bay Area premiere in a production with a cast star-studded with local, long-time favorites under the direction of Ken Rus Schmoll – direction that is impeccable in its nuance, pace, and sense of mystery and discovery. Set in a pristine living room of natural woods, mostly bare walls, and few pieces of furniture or ornaments (designed by Kimie Naishikawa), this home bares no signs of memorabilia of the past and nothing that can be used as reminders of those now living sometime in the future when they are past. Memories in Mr. Harrison’s play are revealed only in the dialogue between the members of the family that we meet. The course of these unfolding memories becomes scenes of a play that Rod Sterling of another generation might have penned for a Twilight Zone episode. Eighty-five-year-old Marjorie lives with her daughter, Tess, and her son-in-law, Jon; but we first meet her going down memory lane (or at least attempting to do so) with a young, terribly handsome man dressed smartly in a suit, tie, and shirt all of grey. Walter a twenty-something who is always smiling and eager to listen, yet noticeably reserved in both movement and most emotions. Together, they recount and build stories of Tess’ past that begin to include Walter talking in the first person as he recalls proposing to Tess the night they went to see a Julia Roberts movie (and her retorting that she wish it had been Casablanca instead). By the time Tess confesses to Walter, “There’s something off by you ... but you’re a good Walter,” we begin to listen for the ‘da-da-da-da’ musical notes of some Rod Sterling episode we somehow missed seeing. But what is actually more amazing, as it turns out, is how with Walter, memories can easily be re-shaped to be made more compatible with how a person wishes they had been. Wish that movie had been Casablanca? Well, wait first a few more recalls, and guess what? Ta-da! Joy Carlin is a sheer joy to watch as a Marjorie who may be losing her memory but has not at all lost a personality that sparkles as much as her eyes twinkle when moments of recalling a happy occasion (or of just remembering what she did a few minutes ago) occur. She loves it when she can remember ZZTop lyrics (a band her kids have no idea what she is talking about), but it only mildly bothers her when she at the same time cannot remember being rushed to the emergency room the night before. 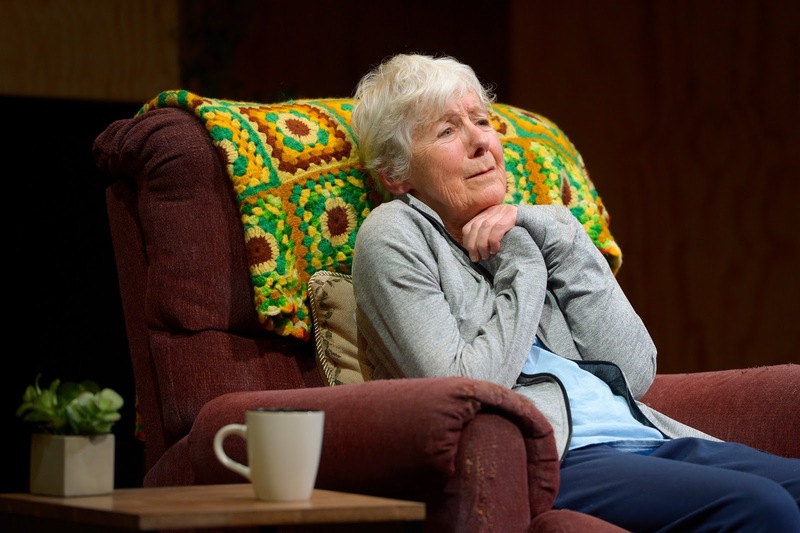 There is both fragility and strength, evident happiness and deep sadness, vague memories of a life lived well and vaguer ones of some of life’s regrets in the way Ms. Carlin portrays Marjorie. More and more, her Marjorie turns with ease and combined looks of love, curiosity, and amusement to this Walter Prime in order to recall for her what she can no longer. Anthony Fusco as Jon seems quite comfortable around Walter and happy for Marjorie that her late Walter is once again in her own declining life. His Jon is devoted to his mother-in-law and quick to do or say whatever is needed in amiable, easy-going ways to make her happy and comfortable. Jon is a natural peacemaker in a household where there are undercurrents of turbulent waters that Walter Prime seems to be stirring. Tess is carrying a load of largely unpacked but definitely affecting memories about the relationship she and Marjorie have spent a lifetime building – memories that have been shaped by a brother, Damian, who died some fifty years prior. Her coming to grips with her own memories and how she wants and wants not to remember her mom becomes a wonderful re-focus of Jordan Harrison’s fast-moving, relatively short look at this family – a seventy-five-minute play he could just as easily entitled Tess Prime since hers is the story most gripping. 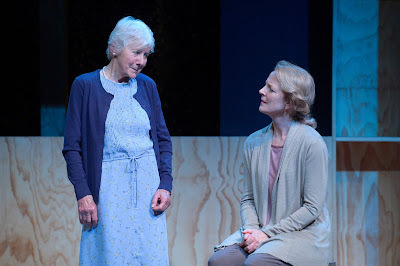 Julie Eccles is outstanding in a role that calls as the play progresses for a much wider range of emotions and reactions than required of the Tess we first meet. And just like that TV, sci-fi series Twilight Zone, not much more can be said beyond the first couple of scenes of Marjorie Prime without taking away the wonderful surprises and shifts to come. Scenes come and go quickly, and so do the realities we see appearing before us. Memories continue to be recalled, created, and re-created in ways fascinating and a bit wonderfully eerie. In the end, Marjorie Prime becomes a juicy episode of fiction to give us some idea of where the day-to-day presence in our lives of robotics and artificial intelligence may be soon be heading. We may well have a difficult time in a few years even remembering when entities like Walter Prime were not members of our immediate family. However, we should long recall this overall enjoyable evening that Marin Theatre Company has given us. Marjorie Prime continues through May 27, 2018 at at Marin Theatre, at Marin Theatre Company, 397 Miller Avenue, Mill Valley CA. Tickets are available online at http://www.marintheatre.org or by calling the box office Tuesday – Sunday, 12 -5 p.m.